It doesn't need depth perception to destroy you. Shepard: The geth are perfect ambushers. They don't move, they don't sleep, they don't even breathe. Ashley: Sir, they have flashlight heads! It seems that if you want to give a (Killer) Robot, Cyborg, or Humongous Mecha a really sinister look, you have to build it with just one eye. Similar to the Uncanny Valley, by deliberately giving androids a characteristic that is not human, you're making the audience realize how creepily in-human they actually are. For more standard robots or Humongous Mecha, a single eye denotes a sinister asymmetry not found anywhere in nature (except the flounder). It doesn't help these eyes are lidless and usually glow a relentless red, creating the illusion of a singular and evil focus. Can easily be justified (though rarely is) by the mention of a rangefinder of some kind, removing the need for stereoscopic optics. Almost always a type of Glowing Mechanical Eyes. Contrast Faceless Eye. Frequently prone to Eye Lights Out. For the organic version, see Cyclops. The MS-06 Zaku II isn't the only example from Gundam, simply the best known. Pretty much all the antagonistic factions in Universal Century and Cosmic Era use monoeyes (normally in the colour of red) for all their mobile suits; Zeon, the Titans, Axis Zeon, Neo Zeon, and ZAFT all use monoeyes almost exclusively. And the only reason OZ's mobile suits don't count is that their eye sensor is so large, it takes up nearly the entire "face", and makes them The Blank. The Maganac Corps' mobile suits also feature a monoeye camera. Even the non-Super Prototype Federation suits from the UC Gundam series, specifically the GM and its derivatives also feature monoeye cameras. They're just less obvious since they don't glow and are hidden behind a visor. This is most clearly shown in the OVAs such as War in the Pocket, Stardust Memory and Unicorn. The late UC era works, from Mobile Suit Gundam F91 onwards have most antagonist factions forgoing the monoeye design, partly as though to say "we're not like Zeon." While the Space Revolutionary Army of Gundam X have the traditional mono-eyes, early United Nation Earth mobile suits have the more unusual triple-eyes. In Gundam 00 the Human Reformation League mobile suit have the monoeye, the Flags and Enacts (and their predecessors) have one visible eye (if you look closely) above the reflective mask (with a scar like marking down the left side that lights up, for dramatic effect) that covers most of the robots face, and the alien-like GN-X series have four eyes. The Death Army from Mobile Fighter G Gundam, with their unique mono-eyes that actually do look like a giant green eye. And Neo Japan's Busshi, which has a traditional-style monoeye. Zeta Gundam is more egalitarian: both the AEUG and the Titans use mobile suits with monoeyes (Rick Dias for the AEUG, and the Zaku-based Hizacks for the Titans). In Mobile Suit Gundam AGE, there is a Earth Federation mobile suit named Genoace, a mass-production unit with one big eye (similar to the OZ-MS from Wing) and the Genoace Custom, which has a smaller eye (actually a small visor, but it's still its eye). On the other hand there are the MS used by Vagan, which all possess a single strip-like sensor across their faceplate. And now, with the mobile suits used by Zalam-Euba Alliance, the series has its own share of Zeon-looking mobile suits. And then there is mobile armor Sid. The Graze-frame mobile suit in Mobile Suit Gundam: Iron-Blooded Orphans has a spherical eye sensor hidden behind the visor similar to the Knightmare Frames (mentioned below). And then there is Graze Ein, which is Ein Dalton being a Cyber Cyclopes himself. The Rodi-frame mobile suit also has monoeye, in this case, a triangle-shaped eye sensor. Generation 4 and 5 Knightmare Frames in Code Geass have a single large sensor, also known as a Factsphere, though they have a sort of "four-eyed" plate covering it. Played straight with the Black Knights' Gekka and Akatsuki series, and averted with any of the Ace Custom/Super Prototype suits (sans the Zangetsu, being a customized Akatsuki). The I- and M-versions of the Codarl from Full Metal Panic!. The prototype has three eyes; actually, the others kept them as well, they just remain unused. In a way, the mass-produced M9 fit this trope as well since it has a single, rotatable eye behind a green visor which is lowered when ECCS is engaged (the prototype has two eyes, as do every other mecha in the series). GunBuster, unlike most of the examples on here, is another instance of the protagonists using a one-eyed machine. GunBuster has even been referred to the god of all Zakus. Subverted in Macross, as the very first Valkyrie had a single eye (although it was blue, usually a "heroic" color). With the exception of the Sound Force mechs in Macross 7, all other Valkyries either go for the mono-eye, multiple distributed eyes (Michael's unit in Macross Frontier), or, most frequently, visors. The Zentraedi mecha play this straight in the original Super Dimension Fortress Macross, since all of them have glowing red mono-eyes. That said, Zentraedi are as often allies as not in subsequent series. And speaking of Robotech, The Inbit of Genesis Climber MOSPEADA have this as a dominating theme to all their mecha. It also just happens to be their weak point. Having been made by the same company as Mospeada, the Paranoid mecha in Gall Force bear a strong resemblance to he Invid, right down to the sensor eye. The series being based upon The Odyssey, Ulysses in Ulysses 31 had to fight a cyclops of course. A gigantic mechanical cyclops. In Mazinkaiser, when Baron Ashura captures Mazinger Z, he/she modifies it to his/her own tastes. One of the eyes, damaged in the fight, is left unrepaired, which is actually a hindrance as that cut the Kyoushouryuku Beam attack's power in half. Neon Genesis Evangelion has Unit 00. On a side note, unit 01 had two eyes, and 02 had four. ...and the Mass Production Type EVA units have no apparent eyes. 1+2+4=7, and seven eyes shows up a lot in the Book of Revelation (and under Lilith's mask). Thus, there weren't any more eyes to go around for the Mass Production Units. We also have Jet Alone, who, much like Maximillian mentioned in The Black Hole (see Film section), appears to have a "furrowed" cyclopean eye, that doesn't even resemble an eye that well. Also, much like Maximillian, it resembles a very sinister grin. Drive Knight from One-Punch Man, a mysterious hero clad in black armor. He has a single shining red eye on his face. The Phantoma's and Raptors in Zone of the Enders. M-11, the Human Robot, from Marvel's Agents of Atlas. His monoeye primarily adds to his inscrutable nature. Subverted in X-Factor. In an alternate future, Cyclops has become a cyborg with several robotic limbs, but while he's still named "Cyclops", he also seems to have mastered his optic powers and no longer wears the distinctive one-eyed visor. The Transformers: More Than Meets the Eye actually provides a reason for why some robots have cycloptoid heads. It's a fantastical form of mutilation called Empurata, where their faces were removed and their hands chopped off, and they were left with just a singular optic and unwieldy claws. Because it was only supposed to happen to criminals, they were publicly humiliated and shamed for speaking against the corrupt government. With their ability to express themselves taken away, they were seen less as people and more as objects, made easier to ignore. Some examples are Autobot Whirl and Senator Shockwave. The Fabrication Machine in 9 bears a striking similarity to HAL. Meet the Robinsons villain Doris is a cyber cyclopian bowler hat. The giant alien probe in Monsters vs. Aliens. AUTO, the sinister auto-pilot, is a nod to HAL. The "keyboard robot" from the scene where WALLE and EVE are going into the elevator is a subversion, since it waves good-bye in a friendly manner as they are leaving, having learned the behavior from WALLE's earlier greeting. HAL 9000 from 2001: A Space Odyssey couples his Creepy Monotone with an unblinking, cyclopean eye. Maximillian from Disney's The Black Hole. "Furrowed" brow added for increased Evil Value. It's also easy to mistake as a grin, all the more disturbing when he's chopping people up. The City of Lost Children has a religious cult of blind men with one electronic eye who kidnaps kids. Gort from The Day the Earth Stood Still (1951) fires his disintegration beam from a single ominous point under his opened visor. In the remake, Gort has a single glowing red eye behind the visor — there's a good moment when one of the characters realises the eye is following him as he walks across the room. Godzilla vs. Gigan: Gigan is a giant space cyborg kaiju with only one eye...that can shoot a cluster of laser beams. The film adaptation of Lost in Space featured "The Robot" with a big red eye and was reprogrammed by Dr. Smith to kill the crew. After being rebuilt and reprogrammed with loyalty, his new shape has a bubble head much like the one in the TV show. GERTY from Moon. Monotone, HAL-like voice? Check. Single, camera-like eye in the middle of his control panel? Check. Subverted in that we don't know for the first half of the film if he's on the protagonist's side or not. It turns out he very much is. Pacific Rim: Crimson Typhoon and Horizon Brave are both mono-eyed robots. AMEE from Red Planet. Not a scary cyclops at all until the inevitable malfunction turns it decidedly unfriendly. It's not just the malfunction, though. The malfunction only makes its self-defense the highest priority. So when the crew start to openly talk about removing its power source, AMEE perceives it as a threat to itself and switches to combat mode. In Sky Captain and the World of Tomorrow (2004), the Giant Mecha that stomp through New York and the Squid Robots that search the Flying Legion airbase have only one eye. Other Killer Robots in the movie have two, though. Non-sinister example: R2-D2 and most other astromech droids, such as BB-8. However, there are many sinister robots with this feature in the same series. The IG series of assassin droids, for instance, along with the G0-T0 Infrastructure Planning Systems, and the IT-0 Interrogator droid. The IG units actually have many eyes, though one large one is most noticeable as it tends to face front while the others stare off in all directions. Ravage has been designed with single eye in Transformers: Revenge of the Fallen. And he's a panther. A giant, one eyed panther. With guns. Made out of razors. Transformers: Dark of the Moon: Shockwave is a spot-on example with all tropes present and correct. He's a giant mecha, with a single glowing-red-eye-of-evil. What more could you ask for? The Cylons from Battlestar Galactica. Notable in that their "eye" is a horizontal red LED light that swoops from side to side. Humanoid cylons in the new series aren't one eyed, though their spines do light up during, err, more intimate moments. (Retcon'd as it being a "metaphysical" lighting up rather than a literal one). Speaking of Cylons: Saul Tigh. Gig Fighters from Chou Sei Shin Gransazer. Daleks have a single eye-stalk protruding from their travel machines, which has changed colour over the years. The short-lived "New Paradigm" Daleks even had obvious pupils, as the production team wanted it to look like there were actual organic eyes at the end of the stalks. WOTAN in "The War Machines", named after a one-eyed god from Saxon mythology. "Four to Doomsday": On Monarch's spaceships, the protagonists were sometimes followed by floating metal spheres with one eye (basically alien CCTV cameras). "The Caves of Androzani": The villain has some non-humanoid (and non-speaking) androids he uses as muscle. They have smooth white (metal?) heads, featureless except for a sort of large slightly recessed circle in the middle of the "face", resembling a high-tech CCTV camera. Lady Cassandra's little spider-like robots (in "The End of the World" and "New Earth") have one glowing eye. KITT in Knight Rider, another Glen Larson production, had a similar array of lights on the car's nose as a Shout-Out to his earlier series. Since this light array is KITT's scanner, it could be considered an eye of sorts. Another heroic example is Gypsy and Cambot of Mystery Science Theater 3000, though Cambot's eye is the camera. It's hard to tell, though, if Tom Servo counts as this as well. In Power Rangers Mystic Force/Mahou Sentai Magiranger - Oculous of the Ten Terrors/Cyclops of the Infershia Pantheon had a single red eye, but he was merely the most techno-based of the ten and not an actual robot. Venjix in Power Rangers RPM is a more typical example, in what is almost certainly a deliberate homage to HAL - but only when he's in his massive computer cylinder form. His robotic bodies throughout the season all have two eyes. The start-up image, advertising image, and "logo", for lack of a better term, of the Android smartphone operating system is a single red robotic eye that looks suspiciously like HAL's. The attacking Humongous Mecha in the Pinstar conversion kit Gamatron has one of these. The main character in Data East's RoboCop, of course. The armor of the New German Republic in Rifts. One of the Ork heads in the Nobz kit also has a bionik bonce with a single slit eye. And an exhaust that makes it look like the Ork is smoking with it. All Crypteks, and many of their Canoptek constructs, sport a single large eye at the centre of their robotic faces, giving these techno-sorcerers a distinctive and sinister appearance. Deathmark snipers possess a single glowing eye that can track the hunter's mark that the sinister assassins place on their target through five dimensions, ensuring that their victim has nowhere to hide. The aptly-named Cyclops assault battlemech from BattleTech has a head which is totally dominated by a red/black eye, which is where the cockpit is housed. In MechWarrior 4, the eye is the mounting point for a laser cannon, while the cockpit has been moved down into the torso. Numerian robots in Pathfinder typically have a single glowing red or blue eye. In Rocket Age the dangerous kind of Ancient Martian robomen frequently have a single slit shaped eye, ala Battlestar Galactica (1978) or The Day The Earth Stood Still 1951. Keetongu from BIONICLE. Subverted in-story, where it's explained he has his real eyes hidden behind the visible one. This is Shockwave's defining feature in any Transformers property. There's also Whirl, who (like Shockwave) got his inhuman appearance from being imported from an earlier toyline. There actually quite a few of these in the movie toyline. None of them are in the movie itself, but some of them show up in the tie-in video games and/or comics. In addition to the more traditional cyclops-types, there are also some Transformers with a "visor" that goes across the face rather than separate eyes. While most come across closer to Cool Shadesnote the various incarnations of Jazz in particular, there are some, such as Tarantulas, that can be seen as a downplayed version of this trope. The white-armored Overwatch Elite from Half-Life 2 have only a single, big red eye. This is probably done to suggest they are highly modified Elite Mooks with wires coming out of their eye sockets and connecting to a big camera. And the ever-elusive, doggedly-persistent Combine Assassins. Not to mention the flying sentries. This was lampshaded in the parody webcomic Concerned with the Elite Mooks suffering from poor depth perception because they have only one eye. Various Mega Man enemies, including Big Eye, the various Joes, the Pantheons, Variants, Galleons, and Devils. Mega Man Legends has the Reaverbots, each of which is one eyed in the first game. In the others some have more. A digital example: LaserMan.EXE from Mega Man Battle Network. Proto Man has a single glowing eye behind his visor in Mega Man 3 when he was sporting his Break Man disguise. Metal Gear RAY of Metal Gear Solid 2: Sons of Liberty had a monoeye. To be more accurate the unmanned mass production RAYs had monoeyes. Although Cyborg Ninja Gray Fox in the first game does have two eyeholes in his mask, the single glowing red sensor in the middle is far more conspicuous. Servos in The Sims 2 and some Plumbots (via Character Customization) in The Sims 3 are one-eyed, but they're only evil if you want them to be. The monster in SimCity 2000 is a large, flying mecha/UFO with four mechanical legs and a blinking red eyeball. The Aperture Science Sentry Turrets in Portal. Not to mention, GLaDOS when you finally see her, plus her little robots that are attached each have one eye. Really, all of Aperture Science's robots are one-eyed, such as Personality Constructs, Atlas and P-Body, and the Rocket Sentry. The Geth from the Mass Effect series have heads consisting essentially of one eye at the end of a thick tube. Certain spirits in Dragon Age II use similar body shape. Reaper Destroyers in Mass Effect 3 are also given one giant red eye to serve as a sort of (very intimidating) face. The fact that it also happens to be an eye-mounted-Wave Motion Gun makes them even scarier. Many soldiers in Deus Ex wore glowing visors to obtain an air of Cyber Punk inhumanity, such as the NSF, MJXII, and commandos. Also, the artificial intelligence Icarus uses a singular eye with metallic plating surrounding it as an avatar. Its successor Helios also has a prominent eye, but the rest of its "face" looks vaguely biological, almost like a cephalopod. The Avatar and Purifier in the Command & Conquer series are the epitome of this concept, although some could say they have in fact seven eyes, just the other six are in the chest, yet, they have a really dark badass look and just one glowing red eye in the head. There's also the Redeemer, which is significantly larger. 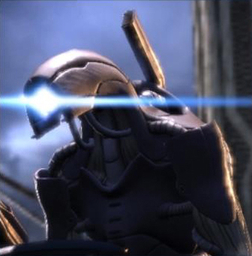 The Brotherhood of Nod also has Enlightened cyborg infantry, with a distinctive cross-shaped eye. The Scuzzer droids from Startopia each have a single red lens, in a fairly obvious homage to HAL. In Sword of the Stars, ships with the AI command section have a KITT-style eye in place of a bridge. Commander Keen 5 has robotic enemies that have a disc shaped body with a black bar on the equator. The bar has a cylon-style red dot that move around until it locates the player. Castle Crashers features one of these as a boss. The "Big Sister" of BioShock 2 certainly evokes this trope . Also the "Rosie" style Big Daddies from the first game. Enemy robots in the Descent series typically have either a single glowing red eye or a Cylon-style oscillating eye. The CY prototype from TY the Tasmanian Tiger 2 has a monoeye that glows a reassuring yellow. Plus it looks like it's made of scrap and a strong wind could shatter it. BlazBlue's Robot Girl boss Nu-13 and Lambda-11 have two forms. An apparently human form with a fancy eyepatch, and her obviously mechanical battle form with a single visor eye. Heavy Mole from Kirby's Adventure is some kind of underground digging machine with a single half-closed eye. It also shoots missiles with a similar monoeye on the head. HR-H from Kirby 64: The Crystal Shards is a strange lighthouse/crab robot that serves as the boss for Shiver Star. Capsule J from Kirby Super Star is basically a mechanical Waddle Doo with a jetpack instead of Eye Beams. It was redesigned and renamed for the DS remake, though, and no longer looks like this. Kirby & the Amazing Mirror has Metal Guardian, a floating orb with a single eye that shoots lasers. Mecha Kracko from Kirby: Squeak Squad is a Robot Me version of Kracko, who also has a single eye. The mini-boss Dubior EX from Kirby's Return to Dream Land has one eye, while regular Dubior has two. Dubior EX returns, now called Dubior 2.0. Mecha Knight (Meta Knight undergone Unwilling Roboticization) has a single mechanical eye in the eye hole of his mask that can move left and right. It can fire Eye Beams. Star Dream appears to be a large, angelic computer with one single orange-colored eye. Star Dream Soul OS has a blood-red colored eye instead. The Aeon Galactic Colossus of Supreme Commander is perhaps the perfect representation of this. Not only is it immense, but has a single eye, which also doubles for it's Eye Beams projector. Krimzon Guard scuttler robots and the Uber-Bot 888, in the Jak and Daxter series. KAOS's third head in Donkey Kong Country 3: Dixie Kong's Double Trouble! Ceres' dream self, Bismuth, in Obsidian, which resembles a rusted-down robot elf made of scrap metal that can teleport at will, and has a spotlight for a head. The Robo Knight boss in Wonder Boy III Monster Lair has a Cylon-type mono-eye. One of the signature characteristics of the Neuropa faction in Metal Fatigue. In the Contra series, this is a common trait in robotic bosses. However it also features Browny and Brownie who are two heroic examples. Magnemite and Beldum from Pokémon. The robots in The Journeyman Project. In the Borderlands series, every robot has one eye—or at least is not stereoscopic. The only exceptions are the "geisha-bot" Sereena (who is never seen in person), Gortys from Tales from the Borderlands, and some "Torgue" bots that are obviously Hyperion loaders with human helmets stuck on top. Many of these robots are menaces, but some (such as the CL4P-TP units) are not, so the trope is zig-zagged. Most of the generic robot enemies (specifically, the Proto and Bugger lines) in Chrono Trigger apply. Justified in Team Fortress 2's Mann Vs Machine game mode. The Demoman robot has a single eye, but the actual Demoman has one eye as well, with his missing eye covered by an eyepatch. In Tales of Phantasia, one of the enemy types found in the city of Thor is a family of robots that possess a single eye and hover above the ground. The alien drones in Fallout 3: Mothership Zeta. Warframe Update 10.5 has General Sargas Ruk wearing a face mask with a single glowing "eye". The Gorgies and a few other robots in Vanquish. Marquis from Battleborn is a robot Battle Butler sniper with a single eye designed like a monocle. Some of the Cyber units in Empire Earth. Fittingly, the first combat cyber was called Cyclops. Fallout 4's Assaultrons are Fem Bot cyclopses with Wave Motion Gun Eye Beams. Bucket from Evolve, as well as all the repair droids his body was based on. The Vex in Destiny come in many forms, but they all have a glowing red eye. This even includes the Cyclops, which is a type of turret instead of a real Vex unit. The Medusozoa enemies are large, jellyfish-like robots with a single large eye. By default this eye is blue, but it turns red as the Medusozoa locks onto its target and prepares to fire its Wave Motion Gun. Panzers resemble Big Daddies with jetpacks, and their helmets, while having a few different designs, always sport a single eye. Bastion in Overwatch has a single slit-shaped eye, except in its Woodbot and Antique skins where it has two smaller but equally rectangular Glowing Mechanical Eyes. The other glowing blue components on its chest and shoulder armour may also be eyes, since they follow the colour of its main eye when it changes. The majority of the Null Sector NPC enemies are Nulltroopers and Eradicators, who also have slit-shaped eyes, with a handful of Bastion units. They also have Slicers, with two eyes arranged vertically, OR-14s, which have four eyes apiece, and Detonators, which have no distinguishable eyes. Roofus the Robot from The Inexplicable Adventures of Bob!. Axe Cop: PSYDROZON is outside! Never Mind the Gap: Gretel is a one-eyed robot — but she's Ridiculously Human, actually quite nice, and maybe a little bit ditzy. Still, under one page in which she is shown enjoying a hot spring, the comic's author commented on the inhumanity of her face by noting that "it's a real challenge drawing Gretel relaxing, because she's got a big round eye that never blinks or narrows." A few Transformers, most notably Shockwave from Generation 1. For The Movie toyline, there were a number of extra characters such as Dropkick added to shore up the numbers. Nearly all of the "extra" Decepticons or non-sentient drones have one eye for a face while the Autobots have regular humanoid faces and two eyes. Transformers Animated has Shockwave, although he doesn't always just have the one eye. There's also Lugnut, but he's defined by the very human trait of zealous loyalty to his leader (also, Word of God is that those things on the side of his head are eyes, so that means he has five of them). Transformers Prime has Shockwave again, largely based on his Fall of Cybertron appearance. Nearly every Transformers property has Shocky in there somewhere. Sometimes due to trademark loss, he's called Shockblast instead. One thing remains in all incarnations, though, and that's the single eye in the center of his head in lieu of anything like a face. The in-universe reason for the Non-Standard Character Design is never explained, with the later exception of Transformers: More than Meets the Eye, where it's a Cruel And Unusual Punishment (or at the very least, a form of torture) to use surgery to replace the face with a featureless face and the hands with claws in a method called Empurata. Breakdown fromTransformers Prime used to have two eyes, but lost one during an attempted vivisection by MECH. TriClops from He-Man and the Masters of the Universe (1983). He's a cyborg who has three eyes, but can only use one at a time. Each one has a different power and color. The Donald Duck cartoon "Modern Inventions" had a one-eyed robot footman. Not evil, really, but rather imposing... and insists on taking one's hat, much to Donald's chagrin. On Batman: The Animated Series, the giant computer HARDAC in "Heart of Steel" had a single glowing red lens that flashed in time with his speech. The successor series, Batman Beyond, has the GOLEM labour robot, which has a single yellow eye, but doesn't speak. The second Teenage Mutant Ninja Turtles has a couple, including killer robots created by Baxter Stockman and Viral, a rogue A.I. in the year 2105, whenever she's in "her" physical form. Megas XLR has these too, as a shoutout/parody of the Gundam's Zakus. In the last episode, Rearview Mirror, we see an army of these things. Coop, the Glorft, and an Alternate Universe Jamie proceed to kick their collective asses. Heloise's snow-making mecha from the Jimmy Two-Shoes episode "A Cold Day in Miseryville", though it looks more cute than scary since its appearance was modeled after Cerbee. Another cute one: Bucky O Hare's Robot Buddy, Blinky. 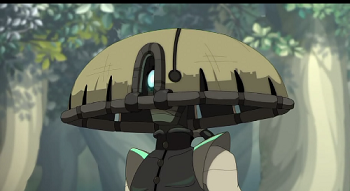 Nox's outfit ◊ in the first episode of Wakfu is meant to intentionally invoke this look, despite Nox not actually being a robot. His strongest creation, Razortime, also has this appearance. Professor Ojo (Spanish for "eye") has a cyber helmet that invokes this aesthetic in Young Justice. The robot spy, from the Jonny Quest episode of the same name, is an iconic example. Monban in Littlest Pet Shop (2012) sports a visor-like area with one glowing red light. Despite his extreme versatility and destructive firepower, he's used mainly as a security guard for the Largest Ever Pet Shop. Many washing machines, especially at laundromats, have a large, round window in the front. It is hardly designed to evoke fear, but it still has the look of a one-eyed machine. Lot of actual robots, usually running on simple primitive sensors have this design. Most military drones have their cameras and other sensors packed into a rotating globular module, which frequently resembles a single, large, unnatural-looking eye. There can be as many as five actual camera lenses, but that just makes it look like a multifaceted eye.